TORONTO—Angel investing is a vital cog in any startup ecosystem, but compared with other parts, it hasn’t received the attention it merits. The work of “angels” often goes unmeasured and under-reported, but that is slowly changing as the passionate but fragmented investor-base increasingly comes together. Angel investors are known for having a deep love for turning small companies into successes and working with passionate entrepreneurs and their ideas—so-called “psychic income.” They are often serial entrepreneurs paying it forward. In Canada, angel groups made 505 investments in 2017, doling out a total of $162.6 million, according to the National Angel Capital Organization (NACO). The average deal size was just under $390,000. Angel investing is on the rise in Canada, which is a positive and much-needed development. NACO held its World Angel Investment Summit as part of Elevate, Canada’s weeklong tech and innovation festival, bringing over 400 of the world’s leading investors, accelerators, entrepreneurs, and policy-makers to grow and professionalize the angel investing community. The data on angel investing in Canada is far from perfect, as many invest informally and operate under the radar, but Navarro said that in the last eight years, NACO members have deployed over $700 million in capital into roughly 1,200 companies. This funding has generated 7,700 jobs and generated almost $1.7 billion in revenue. Furthermore, Navarro said that for every dollar the government invested in the core infrastructure of the angel ecosystem across all its regional development programs, it generated 66 times that amount in angel investments. Randall Howard, Canada’s 2014 Angel Investor of the Year, has had a long, illustrious career in Canadian tech and aims to bring a global view from day one with the startups he invests in. He’s general partner at Verdexus, a private boutique providing financial and management services. Angel investors take on significant risk with their own capital and have to roll up their sleeves to help turn their startups into viable companies. “Trying to figure out how to cram top skills—‘Tier A’ execution ability—into the companies at this early stage is difficult,” Howard said. Howard emphasized that angel investing is more about a good business as opposed to disruptive technologies. He aims to bring rigour and discipline to startups as they grow and singled out marketing as an expertise sorely lacking in startups. “It’s a very complicated, technical, data-science-driven discipline that has many skill sets. So the challenge there is figuring out how to do it at small companies,” Howard said. Small companies have unique challenges that companies with over 100 people and annual recurring revenue in the millions of dollars don’t have. “Angel value creation is figuring out how to optimally build scalable companies at that early stage, when VCs [venture capitalists] don’t have the economics [to invest the money],” Howard said. Angel investors often speak of needing a personable relationship with the company’s founders. For Peter Cowley, president of the European Business Angel Network, it’s a rule. He has started 14 companies as an entrepreneur and invested in 67 others as an angel. “I invest in people and I really believe in those people,” he said in his keynote address on Sept. 26. Cowley said he is backing teams, not technologies nor markets. Angel investing tends to be local and regional. For example, Cowley said he only invests in companies that are within a 90-minute commute by public transit from his base in Cambridge, England. Navarro lauded the government for its venture capital initiatives, which are bringing more structure to the ecosystem. The government uses a fund-of-funds approach, which has larger VC funds investing in smaller ones. This trickle-down effect is creating a gap though, as VCs are moving more upstream, focusing on bigger deals. As a result, the glaring funding gap for startups is in the earlier stages. “That’s really where the angels primarily operate,” Navarro said. More angel capital is needed. The challenge for angels remains the lack of successful exits—realizing a suitable return on investment, given the risk taken and work put in. Cowley has had five successful exits and nine failures. These exits are typically the result of mergers and acquisitions or companies going public. Angel investing is like a crapshoot. The angel hopes that the deals that pay off will more than compensate for the majority that don’t. Navarro said angel investors can be more flexible with their return requirement than VCs, and something like 3x to 5x can work depending on the investor. But on occasion, an angel may realize a 30x or 40x return. 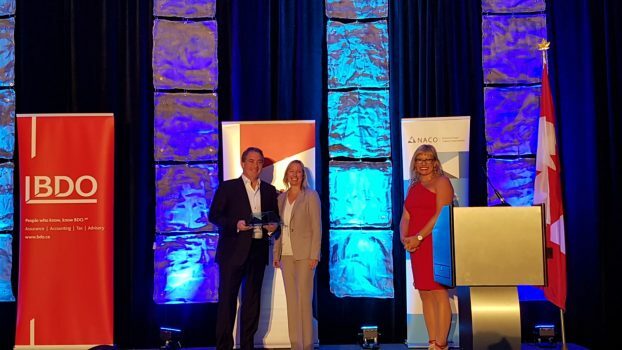 NACO’s 2018 Exit of the Year Award recognized the partnership between Genesis Robotics and its angel investors that achieved a 32x return on investment. The company, founded in 2015, makes motors and other mechanical innovations for robots and machines. It raised $30 million over four investment rounds before entering into a strategic partnership with Koch Industries. 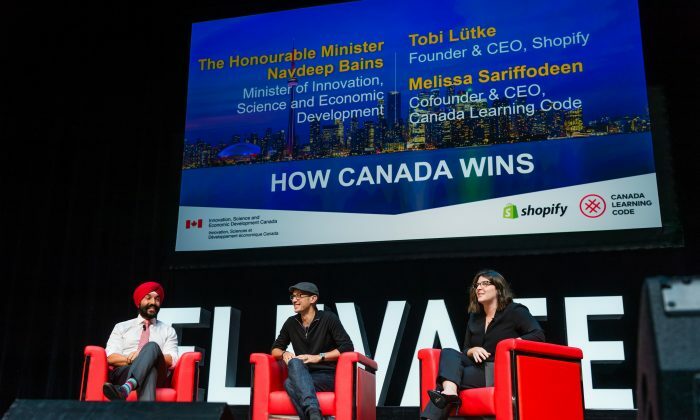 “I would love to have 10, 20, 30 Shopifys,” said Navdeep Bains, Canada’s innovation minister, at Elevate’s “How Canada Wins” panel discussion on Sept. 25 when asked what he’d like to see 10 years hence from Canada’s innovation community. Since it went public in 2015, Shopify has become an “anchor tech company,” as its CEO Tobi Lütke put it when speaking with Bains at the panel discussion. These companies have outsized influence on the tech ecosystem. They are like freight trains, said Lütke. His message is that Canada should not try to rein in these companies and their explosive growth, which would diminish their ability to give back and create even greater economic growth. “Let these companies be freight trains,” he said. Bains said it’s vitally important for government to partner with the tech sector to create the right conditions for success. That means having capital at every stage of a startup’s development so that it can turn into a freight train. “We can’t afford to be hands-off,” Bains said about the government’s role. That attention is now starting to trickle down to angel investors. Mary Ng, Minister of Small Business and Export Promotion, announced at NACO’s summit on Sept. 26 that the federal government is going to spend $1.5 million on six angel organizations in southern Ontario. “Startups have told us they need access to valuable early-stage capital. That’s why our government is investing in angel networks across Canada, so that Canadian startups can get the capital they need to start up, scale up, and access new markets,” said Ng in a press release.